Following Apple's keynote presentation yesterday, authorization filings for many of its newly announced mobile devices started being made publicly available in the FCC OET database. Among others, this included the US variant iPhone XS (model A1920, FCC ID BCG-E3218A) and iPhone XS Max (model A1921, FCC ID BCG-E3219A). The US variant iPhone XR (model A1984, FCC ID BCG-E3220A) was not included. Its authorization documents likely will be disclosed closer to its October release, thus may be the subject of a later update or a different blog post. Before proceeding any further, RF power figures to come represent best averaged and rounded estimates of maximum uplink EIRP test results provided to the FCC OET in individual device authorization filings. Or in the case of ERP low band test measurements submitted in the filings, that ERP has been converted manually to EIRP for level comparison purposes. All EIRP figures are normed against a baseline of 200 mW (23 dBm), which corresponds to a standard conducted power target with unity antenna gain and generally represents good RF transmission performance. Caveats about lab testing versus real world capability and uplink versus downlink always apply. 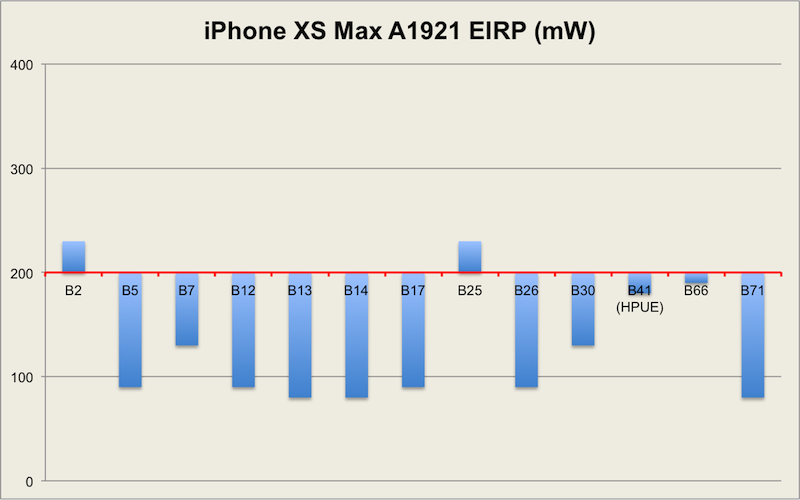 As the blog post title indicates, the lab tested radiated output from the two new iPhone XS models does not set the world on fire. 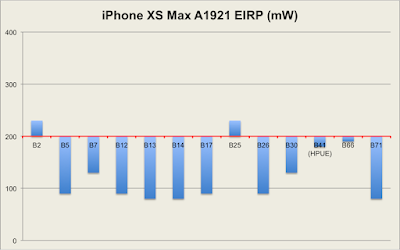 Nearly all bands on both handsets fall short of the 200 mW benchmark. Only band 41 HPUE on iPhone XS looks pretty good on paper, and even that comes with a conducted power asterisk to be analyzed later. But first to nip in the bud one potential conspiracy theory, Apple's decision to forgo Qualcomm this year and source all cellular modems from Intel is not responsible for the RF power output limitations in the new iPhone models. The cellular baseband modem is separate from and well upstream of the amplifiers that generate the conducted power and antennas that generate the radiated power being measured in lab testing. Furthermore, conducted power is not the issue. The standard conducted power target of 200 mW (23 dBm) is +/- 2 dB. And Apple is using the +2 dB margin to enhance its figures, pushing 250-320 mW (24-25 dBm) conducted power across many included bands. This extends to band 41 HPUE, which has a standard conducted power target of 400 mW (26 dBm). 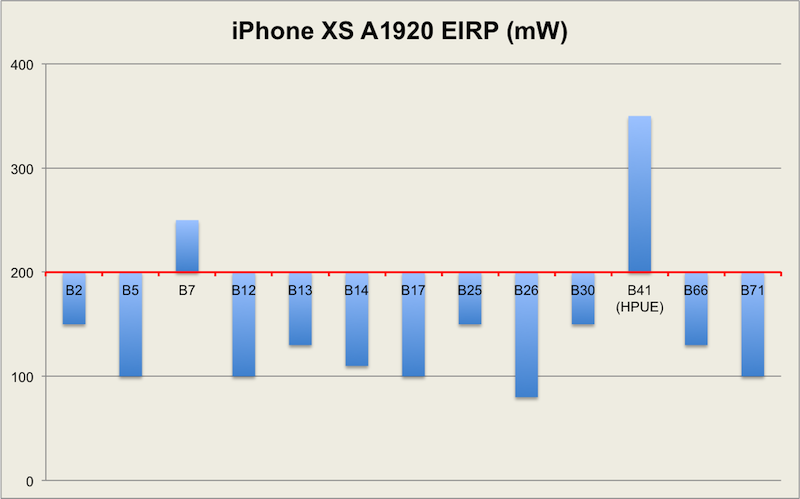 Again using the +2 dB margin, Apple has upped that ante to 500 mW (27 dBm). That inflated conducted power is fine. But bear in mind that it assists only in transmission, never in reception. Plus, it also can be used to mask some antenna shortcomings. Yes, with often greater than standard conducted power being generated -- rhetorical questions ahead -- where is all that power going? Where is it being diminished? The answer lies in antenna gain. Indeed, deeper analysis of the FCC OET authorization filings shows the underwhelming EIRP figures to be almost entirely products of negative antenna gain. For every 3 dB drop in antenna gain, 50 percent of conducted power is attenuated. 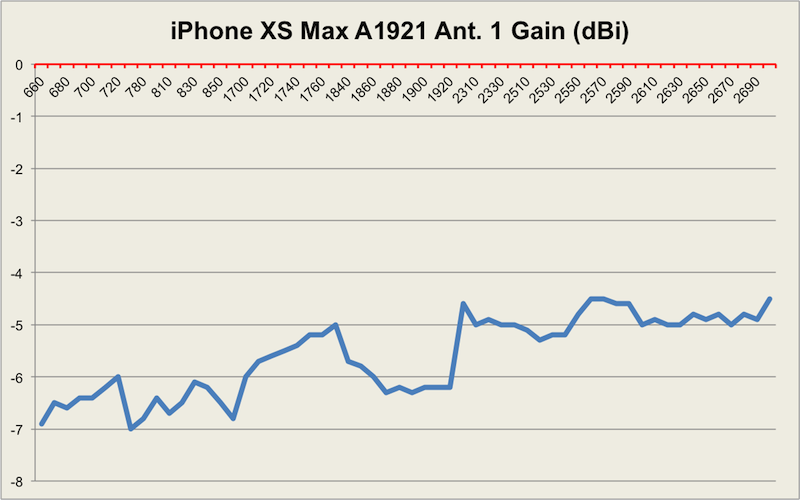 To illustrate visually, look at a graph of the iPhone XS Max antenna gain (Ant. 1) across its entire uplink low band, mid band, and high band frequency range. 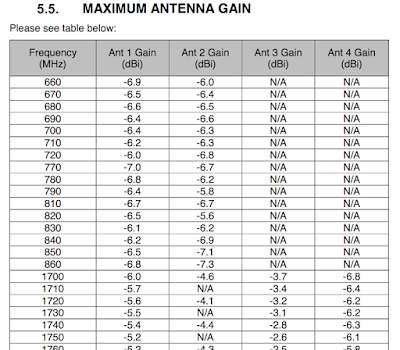 Antenna gain inevitably reduces conducted power by about 5-7 dB. Now, both iPhone XS and XS Max this year incorporate four antennas operational across many but not all bands. That antenna diversity in and of itself is a good thing. However, even with the four antennas -- and possibly because of the four antennas crammed inside -- antenna gain is universally negative. And simultaneous transmission from multiple antennas is not possible due to a "break before make" switching mechanism among the antennas. 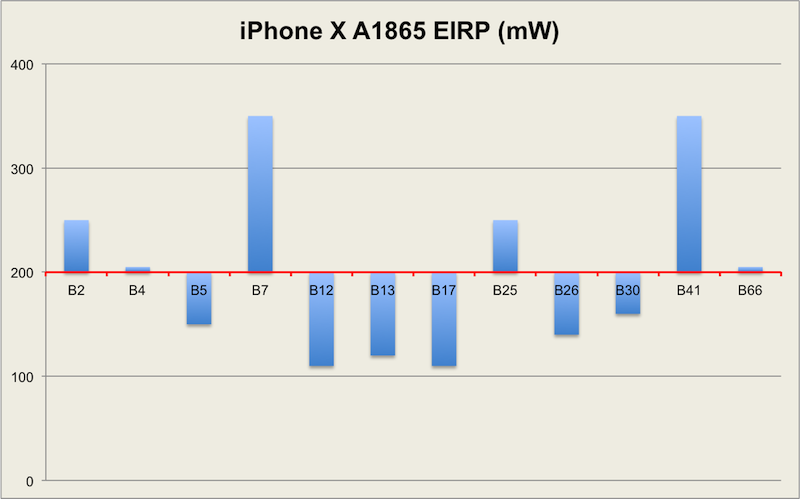 Lastly, for an interesting comparison and stronger RF output, see lab tested EIRP figures from last year's iPhone X (model A1865, FCC ID BCG-E3161A) and iPhone 8 Plus (model A1864, FCC ID BCG-E3160A). The takeaway is that iPhone EIRP in the lab has not always been so compromised as it appears to be this year. Real world RF performance comparisons when some users switch from the iPhone X and 8 generation to the iPhone XS generation, no doubt, will be interesting. Also, see follow up articles (1, 2). Very Insightful, AJ. It would appear that poor antenna design and or antenna tuning circuitry would be the likely culprit. The smoking gun to me is the fact that the Max variant is the poorest performer despite arguably more real estate to optimize the size and positioning of antennas within the handset. I look forward to teardowns to gain further information on the design and tuners used. 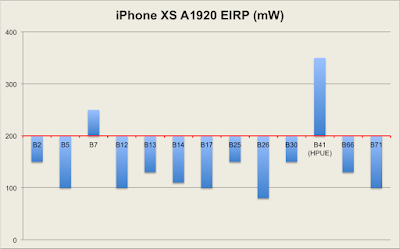 Likewise, I look forward to a comparison of the Xr (with it's alleged omission of 4x4 MIMO) to see how it fares. Thanks for publishing your efforts. This article is getting traction at the MacRumors website. 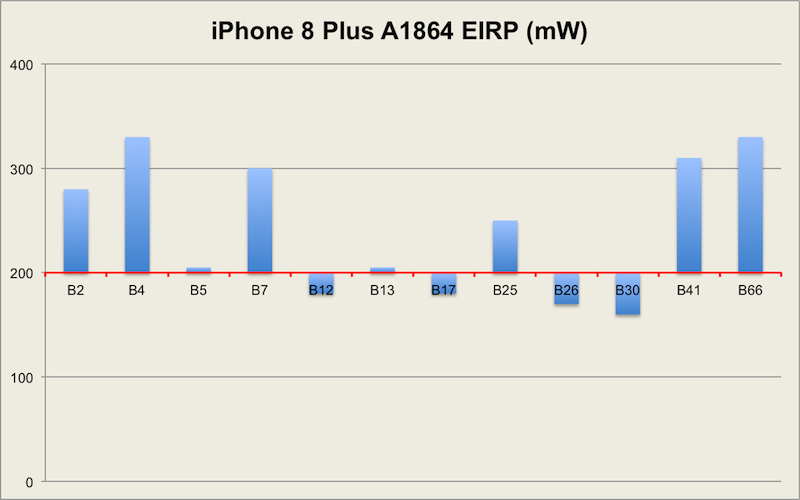 Lots of reports of bad reception, dropped cell calls, poor performance when compared with prior iPhones. Any news regarding the performance of the RF on the XR? That's the one im interest in. No news on iPhone XR A1984 (BCG-E3220A). A device does not require an FCC authorization filing until the device becomes available for sale to the public. That is why iPhone XS and XS Max filings were released just shortly before preorders started. Now my wifi signal is not amazing, but that's important because it mimics so much of my life here in NYC. I can imagine my ability to use my device effectively in many situations is going to be substantially worse off. Ugh....just why Apple? Did you really think the steel was going to sell so many more phones it was worth the risk? Upping the power is a dead giveaway there is a large and difficult to overcome design flaw working here. 5ghz band was the band tested and phone right next to router - Another phone android based phone connects to both at full speed - router problem or phone not sure? You say speed test between apple's iPhone is faster than my note I tried both and my note is greatly appreciated it's got the best wifi calls and my signal strength is always 5 bars. Thank you for the insightful post. Seeing some serious correlation with real life performance and this scientific analysis. I ran this 10 time and the Max always beats the X by just a few points. The last time I ran it was exactly the same on download and upload was .2 Mbps faster on the Max. Just received my Max, considering whether to return it. We got very poor Tmobile signal around our house. It looks iPhone 8 Plus is the best for Tmoible. Yup Apple received a big No Thank You from me. I hope there is a landslide pushback on this and the many other issues people are experiencing. This type of garbage is gross negligence in my opinion at these price tags. Coming from an LG V30, my XS Max has MUCH worse mobile data reception at my office desk and elsewhere. I haven't really noticed if there's an issue with the Wi-Fi. I've called T-Mobile and troubleshooted with them. I've done a network reset. I've updated to iOS 12.1 Beta today with no change. I'm using the same SIM card that I was using with my LG V30. No, the issue is not the power input to the antenna. Carefully read my post, and note that the conducted power levels are fine, even a bit on the high side (~25 dBm). That conducted power would be downstream of the Intel baseband modem and RF transceiver. So, while the Intel chipsets could be responsible for some of the cellular performance problems being reported, the Intel chipsets are not the cause of lower than expected antenna gain and EIRP. Did the iPhone XS and XR drop support for Band 4? I see band 4 results for the earlier iPhone models, but not the current generation. The FCC is tasked with regulating its own licensed frequency bands, not 3GPP LTE bands. Band 66 encompasses all of band 4. Apple or its certified testing lab opted to submit only band 66 test measurements. That is sufficient for the FCC, since band 66 covers both AWS-1 and AWS-3 bands. So is this affecting received data or transmitted data? One, both, and neither. The question and answer are not that simple. The FCC regulates transmitters, rarely receivers. So, the certified lab testing submitted to the FCC reflects only the device's uplink transmission capabilities, not downlink reception capabilities. That certified lab testing submitted to the FCC as part of the authorization process does not measure uplink data transmitted, but uplink power transmitted, though that power ultimately is demodulated into data. Lastly, while certified lab testing submitted to the FCC does not include downlink reception measurements, the uplink transmission measurements are relevant to downlink reception performance as well. Cellular communication always is two way communication, not broadcast communication. The uplink is required for the downlink and vice versa. And the uplink tends to be the weaker link of the two. For example, if the uplink fails because of limited radiated power output capabilities, then the downlink drops, too, resulting in a complete loss of signal. Appreciate your article and your explanation of this situation and its possible ramifications. Is there a hope to solve it with a software update?? Are the iPhone 8 antenna results similar to the plus, also how does the iPhone 7+ Compare to the iPhone 8+ not including band 66 since the 7+ is lacking. Thanks! I am sorry, but I do not have the FCC OET test results data collected for any iPhone generation or variant other than what I already have posted. And at this point, I do not have immediate plans for any follow up blog articles. As for band 66, it is more or less interchangeable with band 4, the former a superset of the latter. Thus, band 4/66 EIRP and antenna gain lab figures are comparable -- even if one device lacks band 66 capability or does not submit band 4 testing in its FCC OET filing. Hello Andrew is there any hope that this LTE/3G & inconsistence Wifi speed issue will be solved with software update? As stated before in other articles there could some improvement from software updates but most likely a hardware issue. I tried 2 different XS phones(with newest 12.0.1) and both had poor LTE/Wifi issues especially when in a lower signal area. One phone had 4 bars and just went to no signal. Had to toggle on airplane mode to restore. My wife’s iPhone 7 didn’t have any issues. Another time I had 1-2 bars and couldn’t hear the conversation clearly(low volume and garbled). Called back 4x all calls were horrible. Immediately grabbed my wife’s iPhone 7 and crystal clear. If I got more then 20’ away from my apple AirPort Extreme my XS would lose the 5gz speed and jump in the 2.4ghz band(235mbs within 20’ then falls down to 50mbs at 30’). My wife’s iPhone 7 had same 235mbs within 20’ and 167mbs around same 30’ range as the previous XS was. Both XS models were returned and will be trying the XR today hoping that I won’t have anymore Lte/WiFi problems. Btw my previous phone that was upgraded was an iPhone 8. I had zero issues with inconsistent LTE/WiFi with that phone. If the XR has connection issues I will give up and go buy another iPhone 8, fingers crossed. Hey Anthony, I'm curious if you have been able to test the iPhone XR in comparison to the XS and/or iPhone 8? If the XR is performing well then I will switch my XS for one. So far very happy. Picked up my XR on 10/26. I haven’t had any Lte “no signal issues” like my old XS had that required an airplane mode toggle. WiFi has been good as well (225 MBs @15’ & 171 mbs @30’). Low signal LTe (1 bar) calls have been clear and not garbled/distant sounding like the XS was. I would say the XR is the same if not better then my old iPhone 8 in regards to reception (which was a great phone that I just got tired of a 4.7” screen). Overall my new XR seems to be a home run for Apple. 6.1” screen is sweet, just as fast as the XS, reliable/consistent LTE/WiFi reception and killer battery life. Best of all $250 less lol. If I had to be picky about my XR then maybe be a little lighter and a tad thinner but coming from a smaller iPhone 8 that’s to be expected. I haven’t had time to use the camera for a comparison but as long as it’s equivalent to the 8 then I’m good with that. iOS 12.1 just came out today. Maybe try upgrading and see if that fixes your issues. Honestly at this point even if the XS Lte/WiFi gets resolved I wouldn’t go back. In the end it’s just a phone and a very good one at that. Yes it doesn’t have a Led screen(not a huge factor for me), no dual camera (I have a Dslr if need be for the perfect shot), 3 gb ram instead of 4gb (can’t notice any difference) and finally no Gigabit Lte( won’t be available nationwide for at least a year but the XR does have band 71). The XR has won me over until next September. I had 4 bars when my XS lost signal that required an airplane mode toggle. (that’s a big issue) If your in a poor reception area then toggling airplane mode only boosts signal temporarily then most likely will go back to where you started. 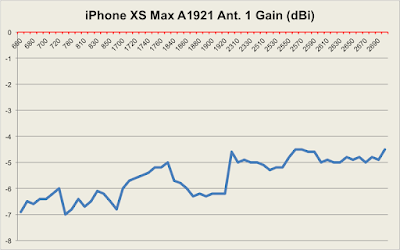 Looking at the chart above the Xs max has the worst reception with only 2 bands above 200 mw. Maybe if someone could comment if 12.1 fixed the reception issues, if not see if apple can swap your phone due to a hardware problem. My XR reception is still doing just as good as my 8 with slightly higher download speeds. Tried the camera today and I am very happy with low light improvements. No regrets with the XR. Hold on, Anthony. None of the graphs reference specifically device "reception," only device transmission. The maximum EIRP figures (less than/equal to/greater than 200 mW) are for transmission. 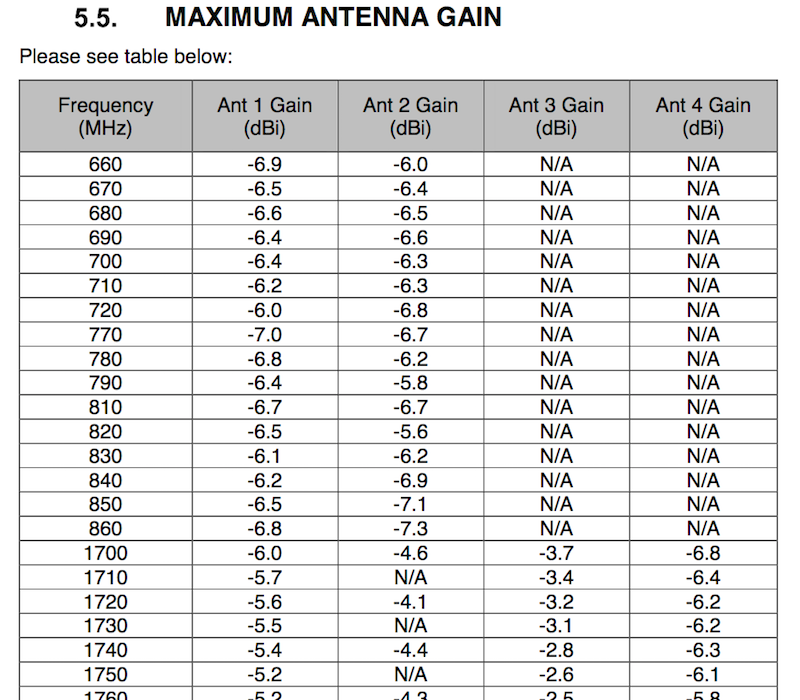 Antenna gain figures are for transmission, though they also may reflect reception. Lab test results specific to reception generally are not required nor submitted to the FCC OET. Sorry and thanks for the correction AJ and thanks for posting this blog. Please Mr AJ can the software fix the problem or not. Anyone having better luck with reception on the Xs and max with the latest iOS updates? Still very happy with my XR, reception has been great and battery life is awesome.